American Pioneer Powder is proud to announce the introduction of 100 and 150 grain velocity equivalent SUPER STICKS™. The SUPER STICKS™ are our most powerful, consistent and accurate STICK™ ever! 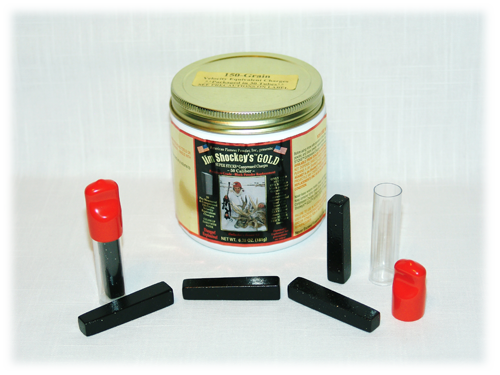 SUPER STICKS™ are available in both our American Pioneer ® Powder and Jim Shockey’s™ GOLD™ brands. Advanced TaperTech™ technology delivers the ultimate ignition along the SUPER STICK™ edges. And SUPER STICKS™ feature all of APP’s famous clean, powerful and dependable performance. SUPER STICKS™ have also proven exceptional accuracy during testing, making SUPER STICKS™ the choice for hunters and shooters who demand the best. Get Super Sticks now at your local sporting goods store and see for yourself why the experts are raving about this revolutionary product. "My SUPER STICKS are my muzzleloading dream come true. American Pioneer Powder developed what I consider to be the Ultimate Blackpowder Replacement available today. Finally, one SUPER STICK does it all, no matter where or what I hunt, anywhere on the planet!" "American Pioneer Powder Super Sticks are the quickest and most convenient muzzleloading hunting charge I have ever used. Just add one Super Stick and you are ready to go. They come in 100 or 150 grains making them the ultimate hunting load. Super Powerful, Super Clean, Super Dependable, Super Sticks."